Isaac Levitan was born in a shtetl of Kibarty, Augustów Governorate in Congress Poland, a part of the Russian Empire (present-day Lithuania) into a poor but educated Jewish family. 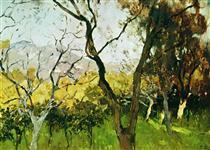 His father Elyashiv Levitan was the son of a rabbi, completed a Yeshiva and was self-educated. He taught German and French in Kowno and later worked as a translator at a railway bridge construction for a French building company. 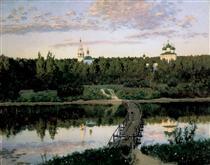 At the beginning of 1870 the Levitan family moved to Moscow. 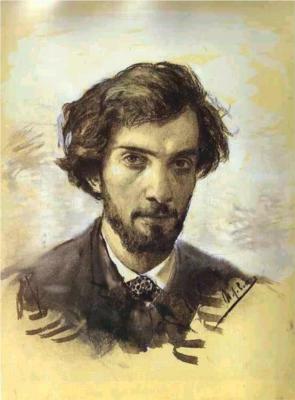 In September 1873, Isaac Levitan entered the Moscow School of Painting, Sculpture and Architecture where his older brother Avel had already studied for two years. After a year in the copying class Isaac transferred into a naturalistic class, and soon thereafter into a landscape class. 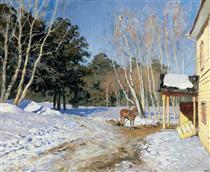 Levitan's teachers were the famous Alexei Savrasov, Vasily Perov and Vasily Polenov. In 1875, his mother died, and his father fell seriously ill and became unable to support four children; he died in 1877. The family slipped into abject poverty. 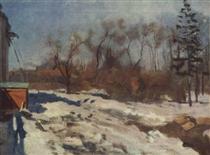 As patronage for Levitan's talent and achievements, his Jewish origins and to keep him in the school, he was given a scholarship. In the spring of 1884 Levitan participated in the mobile art exhibition by the group known as the Peredvizhniki and in 1891 became a member of the Peredvizhniki partnership. During his study in the Moscow School of painting, sculpturing and architecture, Levitan befriended Konstantin Korovin, Mikhail Nesterov, architect Fyodor Shekhtel, and the painter Nikolay Chekhov, whose famous brother Anton Chekhov became the artist's closest friend. 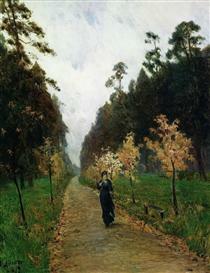 Levitan often visited Chekhov and some think Levitan was in love with his sister, Maria Pavlovna Chekhova. In the early 1880s Levitan collaborated with the Chekhov brothers on the illustrated magazine "Moscow" and illustrated the M. Fabritsius edition "Kremlin". 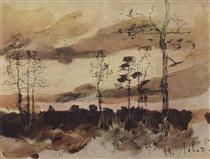 Together with Korovin in 1885-1886 he painted scenery for performances of the Private Russian opera of Savva Mamontov. In the 1880s he participated in the drawing and watercolor gatherings at Polenov’s house. 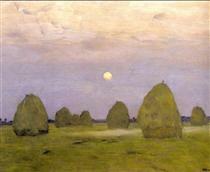 Levitan's work was a profound response to the lyrical charm of the Russian landscape. 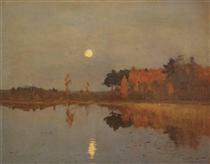 Levitan did not paint urban landscapes; with the exception of the View of Simonov Monastery (whereabouts unknown), mentioned by Nesterov, the city of Moscow appears only in the painting Illumination of the Kremlin. During the late 1870s he often worked in the vicinity of Moscow, and created the special variant of the "landscape of mood", in which the shape and condition of nature are spiritualized, and become carriers of conditions of the human soul (Autumn Day. Sokolniki, 1879). During work in Ostankino, he painted fragments of the mansion’s house and park, but he was most fond of poetic places in the forest or modest countryside. Characteristic of his work is a hushed and nearly melancholic reverie amidst pastoral landscapes largely devoid of human presence. 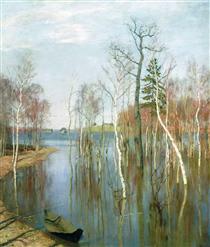 Fine examples of these qualities include The Vladimirka Road, (1892), Evening Bells, (1892), and Eternal Rest, (1894), all in the Tretyakov Gallery. Though his late work displayed familiarity with Impressionism, his palette was generally muted, and his tendencies were more naturalistic and poetic than optical or scientific.